The used Dodge Challenger is a stylish American muscle car that delivers thrilling speed, high-tech safety, and rich interior comfort. Unlike many competitors, the Challenger supplies livable head- and legroom in both rows of seating, making it the most comfortable muscle car on the road. Under the hood, the Challenger generates serious power for a swift, capable ride. Performance gear offers sharp steering and ultra-responsive handling. If you’re shopping for a used Dodge Challenger, check out our buying guide to learn more about how these models have evolved. The third-generation used Dodge Challenger takes its sharp style cues from the original first-generation models. In addition to throwback muscle-car good looks, the Challenger revives its reputation for serious power and performance. If you’re shopping for a used Dodge Challenger, you’ll be happy to know that these models are also big on modern safety and infotainment options. 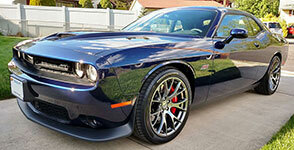 Under the hood, this used Dodge Challenger generates substantial power for a smooth, swift ride. As you browse used models, you’ll find a number of powertrain options. The 5.7-liter V8 produces up to 376 horsepower for a thrilling performance. If you’re looking for something truly special, test-drive a Hellcat model. It uses a supercharged 6.2-liter V8 engine to churn out 707 horses. In terms of interior space and comfort, the Dodge Challenger bests the competition. Both rows supply plentiful elbowroom. Even tall passengers will fit comfortably into the backseat. Luxury features, like leather upholstery, give you the VIP treatment. The central Uconnect infotainment system provides with a sharp, clear touchscreen and responsive voice controls. The system’s smartphone integration features make it easy to send voice-to-text messages or stream your favorite Internet radio stations. Besides magnificent speed and rich interior style, the third-generation Dodge Challenger is big on safety. In government crash tests, it earned a perfect five-star rating for overall protection. High-tech driver aids monitor your surroundings and alert you to danger. The forward collision warning system, for example, lets you know if you’re coming up too fast on the car in front of you. Blind-spot alert helps you switch lanes safely. Use the rearview camera to spot any obstacles in your path before you back up. Heavy-duty brakes help you make strong, quick stops. When the Dodge Challenger returned for its second generation, it wasn’t exactly the muscle car we’ve come to know and love. Whereas the first-generation Challenger provided a range of inline-6 and V8 engines, these models offered smaller, inline-4 engine options. Unlike past and future generations, the second generation wasn’t designed for a speedy performance. 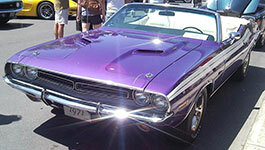 The first-generation Dodge Challenger offered a new brand of chiseled style and stunning power. Compared to competitors, the Challenger offered increased passenger space and richer interior luxury. High-tech features, like air conditioning and a rear window defogger, provided extra comfort and convenience.